64oz Growler - Triple Insulated EcoVessel "Boss"
$54.95 & FREE Shipping on orders over $59 $35. These amazing new EcoVessel triple insulated growlers have the best insulation properties on the market. Able to hold cold temperatures for 36 hours and hot temperatures for 8 Hours, this vessel was tested and outperformed every other growlers insulation. We chose to stock EcoVessel products due to their superior insulation, sleak styling and superior quality. 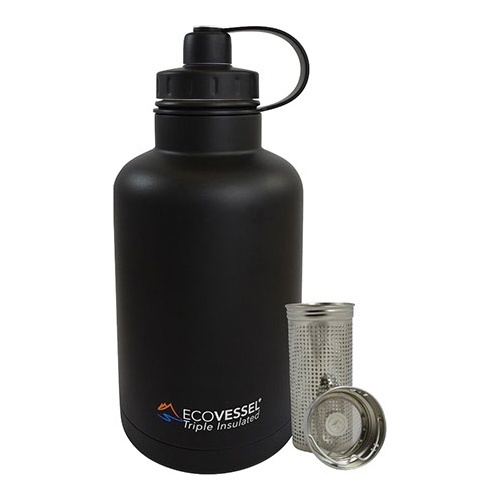 EcoVessel growlers include a built in strainer and a two piece lid. The strainer allows you to infuse your beverage with any desired flavor; from tea to ice to flavoring water with cucumbers, lime, fruit, etc. to dry hopping in vessel, the strainer adds functionallity to this spectacular product. The two piece lid gives you the flexibility of a wide mouth for direct flavoring additions, easy filling and cleaning or the narrow mouth for consumption. Both pieces are screw style. EcoVessel products are perfect for any and every beverage! Bring THE BOSS along on your day off…or your next adventure! Fill this reusable stainless steel growler with icy cold craft beer at the brewery or fresh hot coffee from home or your local coffee house. We’ve included a removable stainless steel infuser, so you have the option of adding the flavors of fresh fruit to your drinks. If you’re a tea enthusiast, fill the infuser with leaves and the Boss will be your favorite tea maker. On a summer day or warm evening, pour some wine in the growler, add sliced of oranges, limes, pineapple and enjoy refreshingly chilled sangria that will stay cold all day - perfect to take on a picnic or day at the beach! This growler features our vacuum TriMax® triple insulation technology and has been tested to keep liquids cold for 36 hours and hot up to 8 hours. Its dual use leak proof top has a wide opening for easy filling and a small opening for easy drinking. A versatile vessel for anything, anytime, anyplace and now available with interchangeable tops! EcoVessel is based in Boulder, Colorado at the base of the Rocky Mountains. Jon Fox started EcoVessel in 2009 in response to the safety and environmental concerns that arose from the use of plastic water bottles. 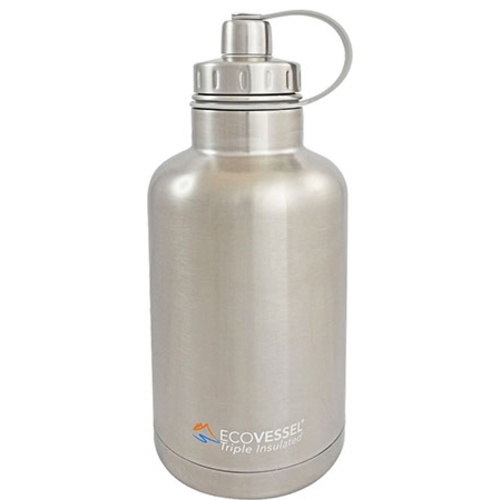 After realizing the lack of quality reusable bottle options available for him and his family, EcoVessel was formed. Innovation and creativity have been part of our DNA since the beginning and our signature TriMax™ triple insulated hydration vessels have been independently tested to outperform our competitors.